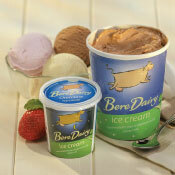 Why not have our ice cream at your wedding or event. Our ice cream cart will add something special to any wedding. With 8 flavours to choose from there is something for everyone from small children to grown-ups – we just come along, fill up the cart with ice cream tubs and let your guests help themselves. We can also come to your event or local show and serve our ice cream in cones.